These socks are awesome! This is the first time I’ve tried self-striping yarn, and it really is super cool. 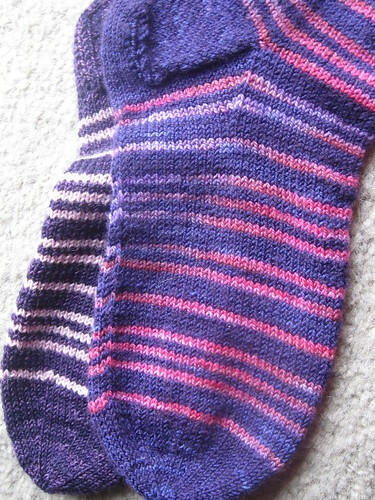 It also worked out that the stripes matched exactly on both socks (I’m not sure if that’s supposed to happen). The pattern was also really easy to memorize, and looks really good with this yarn. I’m very pleased with these. Here we see the danger of dyelots. I knew that dyelots are different, especially with koigu. When I made the first sock (the lighter of the two with the hot pink), I thought I would have enough purple for both socks. Sadly, no, I didn’t, but then I figured that I could just go to Loop and buy more, since that’s where I got it from in the first place. Also no. They sold out of that color and haven’t gotten it back since. Additionally, I threw out the ball band, so I had no idea what dyelot it was. 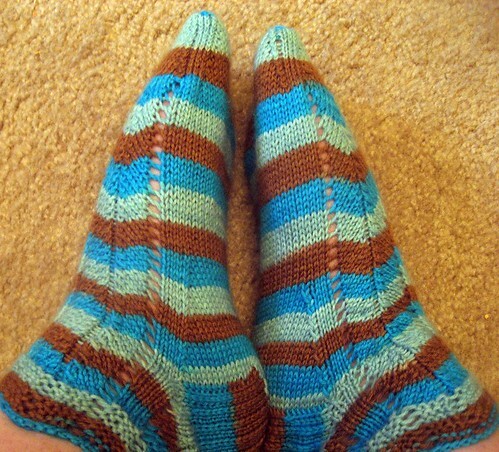 These are birthday socks for my sister that needed to be finished, so I succumbed to desperation and bought more koigu. Same color number, different dyelot. I still think these socks look okay, but I really wish I had enough to finish both. The fact that it’s a Nancy Bush pattern eased my pain somewhat. I’ll be giving my sister another pair sometime soon, certainly one of the pairs I make during Summer of Socks, which begins June 21st (I think). Until then, I have a few other things to work on.